In Illinois, if spouses have a prenuptial agreement, any provisions regarding spousal inheritance rights take precedence over a deceased's will. Two circumstances can arise here. First, when one spouse disinherits the other in a will, but there is a prenuptial agreement stating that a surviving spouse is entitled to certain estate assets, the surviving spouse will inherit those assets named in the agreement. However, the opposite can also occur. A surviving spouse may expect a bequest from the deceased's will, but if a prenuptial agreement waives any inheritance rights, the spouse will receive nothing. When a surviving spouse is left out of a will in Illinois, she may renounce the will and claim a portion of the estate. The surviving spouse must submit a petition for renunciation to the probate court in which the will was filed. This petition must be filed no more than seven months after the will was submitted for probate. The petition must include a statement declaring the spouse's desire to renounce the will and be signed. A spouse's right to inherit from a deceased spouse's estate after renunciation of the will, known as right of renunciation, is also called the right of election or elective share. Once a probate court determines there is an estate from which the surviving spouse can inherit, the spouse will receive a percentage of the estate. This percentage is awarded after all outstanding debts are paid from estate assets, including the decedent's outstanding bills, funeral expenses and estate taxes. If the decedent is also survived by children, the surviving spouse will receive an elective share of one-third of the estate. If there are no children to inherit, the spouse's share increases to half of the estate. A surviving spouse, whether or not she is disinherited, is also entitled to support from the estate. This support award, set at no less than $10,000 in Illinois, is designed to provide financial support for the first nine months after the deceased spouse's death. The award is set at the court's discretion, based on the standard of living the spouses enjoyed at the time of the decedent's death. 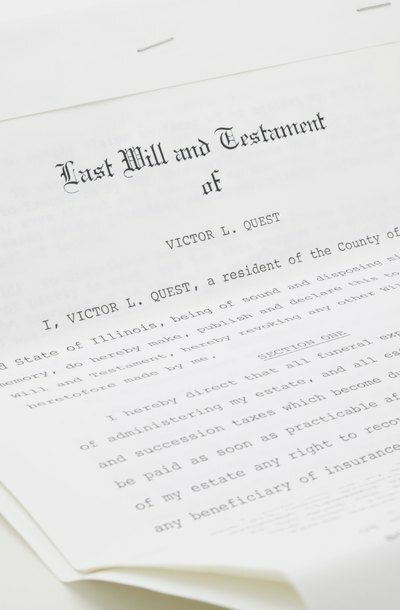 Illinois is one of only a few states that allows a spouse to arrange his estate in anticipation of his death, in order to make sure there is little or no property for a surviving spouse to claim through renunciation. If a spouse puts most or all of his property in a living trust, that trust is not considered part of his estate when a surviving spouse attempts to claim her renunciation share. Additionally, if a decedent owned property as a joint tenant, with anyone other than the surviving spouse, that property passes through right of survivorship to the surviving joint tenants and is not available for a surviving spouse to claim a share. Illinois General Assembly: Illinois Compiled Statute Sec. 2-8. Renunciation of will by spouse. Estate Planning Memorandum: Can I Disinherit My Spouse?